This week, culinary duo Russell James Alford and Patrick Hanlon – aka GastroGays – create a master recipe for a tongue-tingling Mexican chilli. And it’s accidentally vegan too! MEXICAN IS A cuisine that we crave so often – it’s got clear, fresh flavours and a spicy base. Everything tastes comforting while also being a little exotic and exciting – whether it’s DIY tacos, gloriously indulgent enchiladas or a quesadilla stuffed with leftovers and fried to a crisp. Veering away from heavy, in-your-face Tex-Mex, opt for fresh in the form of leafy coriander, piquant chiles, creamy ripe avocado and fresh tomatoes bursting with sweetness. A few staple ingredients in stock and you’ll be amazed how many dishes you can make. 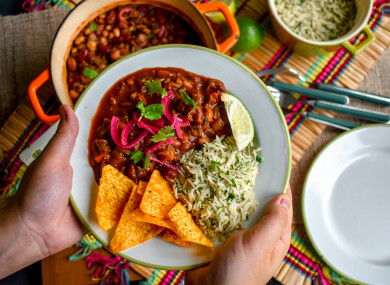 We’re sharing a recipe for the ultimate bean-based, vegan chilli which is a cinch and in a large enough portion is perfect for entertaining or just meal prepping ahead of a busy week. Best thing is that the flavours mellow and merge together a day or two after this is made, so it’s the ideal make-ahead dinner. Also, instead of buying pre-bought dips with tortilla chips, try our recipe for the ultimate guacamole and tomato salsa – so quick and simple with buckets of fresh flavour. Next time you’re having friends over and setting out some nibbles with drinks – make these the star. Accidental vegan alert! This tastes so good you won’t miss the meat. In fact, it tastes less heavy than a meaty chilli but is packed with bucketloads of protein so it’s the ideal swap-out if you’re after a slightly healthier version of the spicy, comforting, crowd-pleasing classic. Plus, you probably have the bulk of these ingredients in stock at any one time – a half bottle of wine, a couple of tins of beans, some spices that need using up. 1. Sweat the onion, peppers and garlic in a heavy pot in a little bit of oil over a medium heat. Sprinkle with some salt and allow to cook down, turning soft and translucent. 2. Meanwhile, using a food processor, blitz the mushrooms in batches until you have small chunks (but not a mush, allow the processor to do in seconds what fine chopping would do in ten minutes) and then fry off in a large frying pan over a medium-high heat to draw out all the water. You may need to do this in two or three batches, also. 3. Add the spices to the pot and coat the ingredients, before adding in the wine, amping up the heat and allowing to reduce until almost all gone. This adds colour and depth and helps aid the thickness of the chilli. 4. Add the passata, swilling the tin, carton or jar with water to get every drop, and bring to the boil. 5. Add the cooked mushrooms, beans, the chocolate and bring down to a low simmer. Clamp on a lid and allow to cook together for 15 minutes. Tip: this gets better a day or two after when the flavours all mingle together! Make this ahead or do a big batch on a Saturday or Sunday and it will pay dividends for lunches and dinners through the start of the week. This also freezes really well. Plain white rice is a wonderful thing, but it can be same-y and boring. Try this simple addition to add tonnes more flavour to this ideal side dish. Cook the rice per packet instructions. Finely chop coriander or parsley and stir through the warm rice. Season to taste. Tip: A rice cooker is a cost-effective investment if you enjoy rice once or twice a week. It steams the rice perfectly. The one guacamole recipe you’ll need. Simple, fresh and moreish, guacamole is best left as simple as possible, so this recipe is one we come back to time and time again! This takes seconds and is the perfect addition to breakfast topping slices of toasted sourdough – or as a nibbles ’n’ drinks get together with friends or family. 1. Run a knife around the circumference of the avocado and pull the two halves apart. With a little force, hit your knife into the heart of the avocado stone and gently prise it from the middle. Discard. 2. Mash the avocado flesh to desired size (chunky or smooth) with half of the lime juice, salt and pepper. Taste, season or add in extra lime juice as necessary – don’t drown it in lime juice or it will turn to gloop. 3. For a spicier hit, add Tabasco to taste or stir through freshly diced red chilli or chilli flakes for a fiery bite. 4. Serve with lots of tortilla chips and other homemade dips and salsas for a fresh, enticing Mexican sharing platter. Tip: How to tell if an avocado is ripe? Feel the bumpy skin and very gently press. If the flesh inside slightly gives, it’s a sign it’s ripe inside. Also, if the pip at the top when pressed inwards very easily gives it’s another sign that your avocado is perfectly ripe. Avoid any avocados with noticeable soft or damp patches. 1. Finely chop all the tomatoes – scrape away the seeds for larger ones to avoid the salsa becoming too watery, for smaller, cherry tomatoes there’s no need. 2. Finely dice the red onion, fresh chilli (if using) and garlic into very small dice and add to the tomatoes. 3. Add the vinegar, sugar and salt and stir everything together. Taste for seasoning. Allow to sit together for 30 minutes or so to let the flavours mingle, best overnight but not essential. 4. When serving, stir through the chopped coriander for a refreshing hit, but for those coriander-averse, switch out for parsley. 5. Serve with guacamole, tortilla chips and some other homemade dips. Tip: This will keep, covered, in the fridge happily for at least three days. Email “The perfect summer feast: Crave-worthy Mexican chilli and the only guacamole recipe you'll ever need”. Feedback on “The perfect summer feast: Crave-worthy Mexican chilli and the only guacamole recipe you'll ever need”.